Has youth and black youth unemployment taken a proportionally worse hit than overall unemployment. Sure looks that way. Eyeballing it puts the overall youth rate up about 12 percentage points and the black youth rate up about 16 since 2007. The overall rate was 4.6% in January 2007 compared to 9.7% today, or a jump of 5.1 percentage points. Clearly this is not just rising unemployment across the board, but something distinctly affecting teenagers and black teenagers in particular. Like say the minimum wage increase. The WSJ piece is behind their new and very annoying subscriber gate. However, you can circumvent the gate by going to Google News and searching "The Lost Wages of Youth." That link will take you there. And that strategy works for all of their gated material. This should REALLY be done with real wages, Steve. And it also oughta look beyond just a major recessionary period. I see a steady decline in the real minimum wage through the 80s paired with a spike in teen unemployment (due to a recession, granted). There's a steady decline in the teen unemployment rate through the nineties - a time when there were two spikes in the real minimum wage. And teen unemployment began climbing again between 2000 and 2005, at a time when the real minimum wage was falling. Forgive me for not seeing the clear picture that you seem to. I'm very much in the "small if any effect, and it largely depends on the idiosyncracies of an individual market" camp when it comes to the minimum wage. So I'm not rejecting the narrative you're presenting. Obviously raising real labor costs should lower employment unless there are specific reasons to think it doesn't. I'd just be careful about overstating the case. Particularly overstating the case with such misleading data - nominal minimum wage rates during the buildup to a recession don't prove your point at all. 1. In a recession those with the least skills will tend to be hit worse. Hence, it would be expected without a minimum wage for the unemployment rate of teens to rise faster and more than the overall unemployment rate. If minority teens tend to have even lower skill levels than teens overall this would also apply to that rate. 2. I still agree with your policy recommendations (even if the statistics here are weak, there are plenty of others and theory to make the case), but I think the omission of ending public housing and further reforming welfare is glaring. Housing projects and related welfare programs have probably done the most to create ghettos and trap people in poverty. "I'm very much in the "small if any effect, and it largely depends on the idiosyncracies of an individual market" camp when it comes to the minimum wage. So I'm not rejecting the narrative you're presenting." Now that I think about it, this seems pretty ambiguous. I mean I'm not in the Card and Krueger camp that gets excited about minimum wages. I'm guessing generally speaking they do somewhat hurt employment, but the effect is probably negligible. And I don't think it's outlandish to think that there are specific circumstances, along the lines of Card and Krueger, Alan Manning, etc., where it might even be a net positive. But generally speaking I think a micro 101 take on the minimum wage is probably reasonable as long as we don't twist that into some sort of doomsday for teens. I'm not arguing that the increase in the MW over the last few years explains ALL of the increase in teen unemployment. Clearly lower-skilled workers are likely to be disproportionately affected by the recession. But I AM suggesting that it has very likely made matters worse. And for all the attempts to deny the effects, it's funny that throughout history, higher-skilled workers have often supported MW laws and lower-skilled ones objected to them, which strongly suggests that THEY understood the effects and thought they were real and significant enough to matter. Whatever the year to year fluctuations, it remains the case that prior to the federal minimum wage, the black teen unemployment rate was LOWER than the white rate and both were substantially closer to the overall unemployment rate than they are now. And non-white and immigrant workers were very much opposed to those laws. On such matters, Armen Alchian would observe that all of economics is built upon the fact tha demand curves slope downward. Call that into question, and you have no discipline. Historically the teen unemployment rate has been 2.8 times the overall unemployment rate. If you look at the teen unemployment rate this cycle you can explain the entire increase in the teen unemployment to the same cyclical factors that drove the adult unemployment rate to 10%. 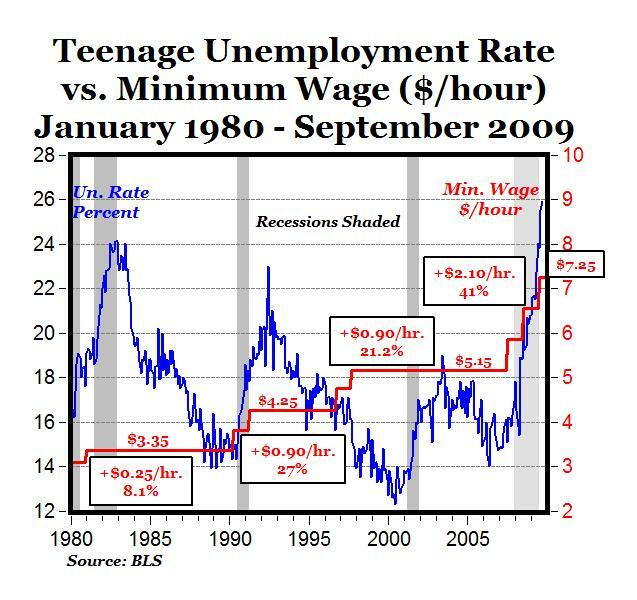 This analysis suggest very strongly that the increase in the minimum wage had no impact on the teen unemployment rate. Have you tried to determine how much of the rise in the teen unemployment rate was due to the minimum wage and how much was due to cyclical factors? If you haven't your analysis is seriously deficient and should be viewed as some ideologue pushing a point of view rather than a serious economic analysis. Well since this was a blog post and not a journal article, I didn't set up a nice big model and run the data. You may well be right Spencer. As I said in the follow up comment, cyclical factors are certainly in play. I make no claims to infallibility or omniscience. As far as I know, the bulk of the newly unemployed were low-skilled and black, so I assume also young. This can also explain, probably, why average wage rates have increased, especially in construction, despite the rise in unemployment. It is during a bust that nominal price floors are more likely to become binding, and have a real impact, so I guess that the increase in the minimum wage is likely to have had some impact, I don't know how much. I'm not very confident that significant numbers can be put behind these arguments, especially in a period of structural change such as the present one: just treat low-skill laborers as outsiders with no strong ties to the firm and you obtain the same result (observational equivalence). Good post, Steve. But I wonder if, following the example of some libertarians who urge that we drop the word "capitalism," http://blog.mises.org/2010/03/should-libertarians-oppose-capitalism/ , if we should refer to unemployment as unexploitation. Then it doens't sound so bad when exploitation is falling! To help urban youth out of poverty, I would add a fifth plank to your fabulous four: repeal zoning laws. Lacking capital, being able to work out of the home or in nearby vacant space could be the difference between starting that haircut business or not. It also reduces advertising and promotion costs if your customers are your neighbors. They are just optimizing tax revenue to fund social welfare programs. 12% is probably their worst case scenario, and roughly breaks even. As employment begins to come back, the gov't will "make" more money. They really don't care who is hurt and who is hurt "more" when they can just mandate that you must hire more minority workers that are under 18. Minimum wage laws are a violation of freedom of commerce, which I define as the right of citizens to freely engage in mutually-agreeable commercial transactions - assuming, of course, that no coercion, deception, or dangerous materials (those which are deemed to require the fulfillment of a condition to purchase) are involved. I think freedom of commerce should be viewed as a fundamental human right, along with freedom of speech and freedom of religion. It seems to me that whenever freedom of commerce is infringed on by a government, the people as a whole will suffer. I don't even feel that I need to look at economic studies - the results of which are always debatable - to know that the minimum wage does more harm than good. Sure it helps some people, but what about the businesses which fail or are adversely affected and what about those who consequently can't find employment and are thus more prone to depression, drug addiction, prostitution, and/or crime? Ending minimum wage laws would not prevent the government from directly helping those whose employment did not pay them a living wage. It is time that the government stopped evading its responsibility to help the needy by trying to force businesses to do so. No minimum wage laws, no forced employer benefits, and no price controls for independent (not receiving government favors) merchants and service providers. Yes to higher taxes (with a very simple tax code), if necessary, so the government can adequately help those who truly can't help themselves. That is not a moral imperative for the well off but simple wisdom, as it will vastly reduce the crime rate, on the one hand, and on the other life could make any of us one of the needy at any time. I actually expanded on this problem in the article I posted today. This displays the (rhetorical) predilections of conservative and libertarian economists and bloggers: they constantly cherry-pick particular "textbook" (read: grade-school) economic theories even when their simplistic constructions are contradicted by the real-world evidence. "Policymakers who want to promote growth would not go far wrong ignoring most of the vast literature reporting growth regressions. Basic theory, shrewd observation, and common sense are surely more reliable guides for policy."